Frank, Frankie and Rocco show off the medallion. 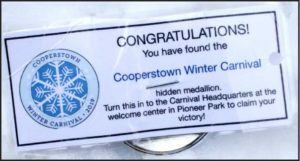 COOPERSTOWN – If Frankie Panzarella, 13, hadn’t bumped his head, he and his dad Frank might never have come across the 2019 Winter Carnival Medallion. It wasn’t until he turned it over that he realized what he was holding. The medallion was hidden on the back right side of the trash cans at Badger Park. “I felt fine once I found it!” said Frankie. 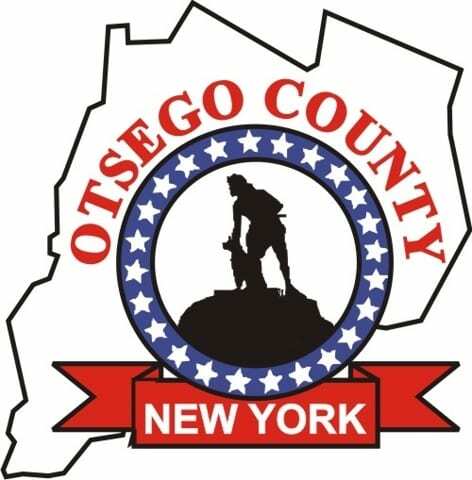 This is only the second year the Panzarella family has joined the annual hunt for the medallion and $500 prize, offered by The Freeman’s Journal & Hometown Oneonta. 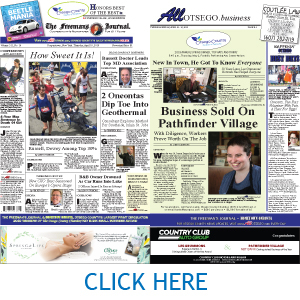 According to Mohican Flowers’ Carol Waller, whose husband, Bill, devised the clues this year, the Derrick Stack was the chimney on furnaces from when the Derrick family had greenhouses in what is now Badger Park. Their name was written on the side, and the chimney was demolished when Bob “The Badger” Seaver gave the park to the village. Even their one-year-old pup, Rocco, got in on the fun. “He was digging around the garbage box!” said Frankie. They also had to endure being minor celebrities for the weekend. “People were coming up to us and saying they’d looked in Badger Park the day before, or that they were going there over the weekend to look!” he said.